Happy New Year! We wanted to send out a quick update announcing the new features in Edit Flow v0.8. A simple, plain text notepad that allows admins and editors to leave notes that are visible to all users who have access to the dashboard. This is useful for leaving instructions, notes, or important announcements. Quickly create posts or pitches by double clicking a day in the calendar. Drag and drop posts to reschedule them to a different day. Click on a post to see metadata and quickly access Edit, Trash, Preview or Follow buttons. Subscribe to your calendar in iCal or Google Cal by enabling subscriptions in Calendar settings, and grabbing the secret URL in “Screen Options” on the calendar page. New Russian localization by to te-st.ru. Updated Japanese localization by naokomc. Updated Dutch localization by kardotim. Following posts: New “Follow” links for posts across the Manage Posts, Calendar, or Story Budget page allows editors to easily follow or unfollow posts without needing to open the post. Editorial Metadata dates: Ability to assign both a date and time to the editorial metadata’s date field, which helps clarify deadlines. Email alerts: Scheduled publication time added to relevant email notifications. For more details on improvements, bugfixes, and contributors, please visit the changelog and the Edit Flow development blog. You can follow along Edit Flow development on Github. If you’re interested in contributing, the Issues page is a great place to start! And finally, the following folks did some tremendous work helping with the release of Edit Flow v0.8: azizur, bbrooks, cojennin, danielbachhuber, drrobotnik, Fstop, jkovis, kardotim, keoshi mattoperry, mbijon, naokomc, natebot,nickdaugherty, paulgibbs, rgalindo05, te-st.ru, willvanwazer, ziz. New Japanese localization thanks to naokomc. New French localization thanks to boris-hocde. 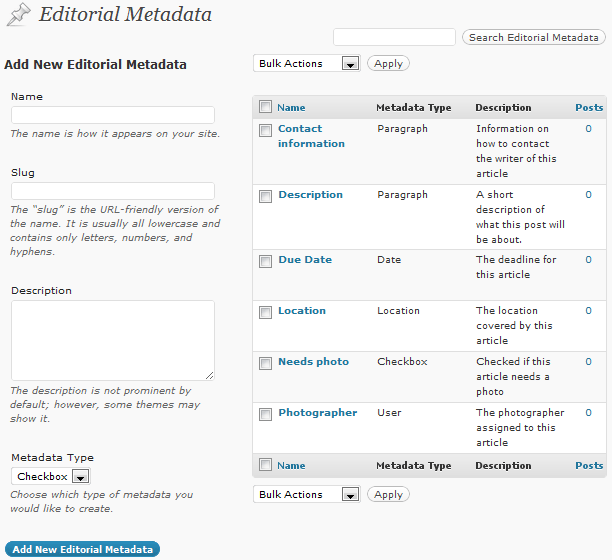 Editorial metadata names can now be up to 200 characters (instead of 20 previously). Props cojennin. Bug fix: Load modules on ‘init’ so the strings associated with each class can be properly translated. Bug fix: Pagination functional again when filtering to a post type. Bug fix: Pre-PHP 5.2.9 array_unique() compatibility. Bug fix: Respect the timezone when indicating which day is Today. Bug fix: Calendar should work for all post types, regardless of which are supposed to be added to it. 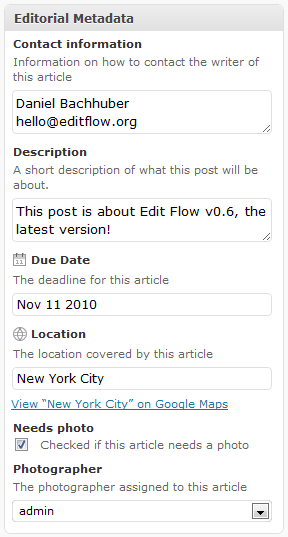 Also of note: edit(orial) flow is coming to core for WordPress 3.6! This will mostly be bug fixes around custom statuses, but I’m hoping to release Edit Flow v0.8 around the same time. Let me know if you’d like to help with contributing. As always, please hit us with questions, feature requests, and bug reports in the WordPress.org forums. Added ‘Scheduled’ as one of the statuses you see in the ‘Posts At A Glance’ widget. ‘Private’ and other core statuses can be added with a filter. 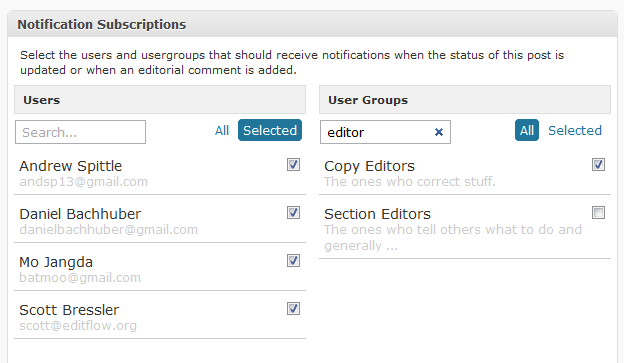 Sort posts on the Manage Posts view by visible editorial metadata date fields. Modify email notifications with two filters. Bug fix: Proper support for unicode characters in custom status and editorial metadata descriptions. Bug fix: Show the proper last modified value on the story budget when the server’s timezone is not set to GMT. Props danls. Bug fix: Make the jQuery UI theme for Edit Flow more specific so it doesn’t conflict with core modals. Bug fix: Use the proper singlular label for a post type when generating notification text. Shows the year on the calendar and story budget if it’s not the current year. Allows users to save post subscriptions the first time they save the post. This also fixes the bug where a user wouldn’t be subscribed until they saved the post twice. Changed the behavior of notifications for the user changing a status or leaving a comment. Previously, they’d receive an email with the action they just performed; now they do not. This can be changed with a filter. New Italian localization thanks to Luca Patané. Bug fix: Auto-subscribe the post author to their posts by default but make it filterable. 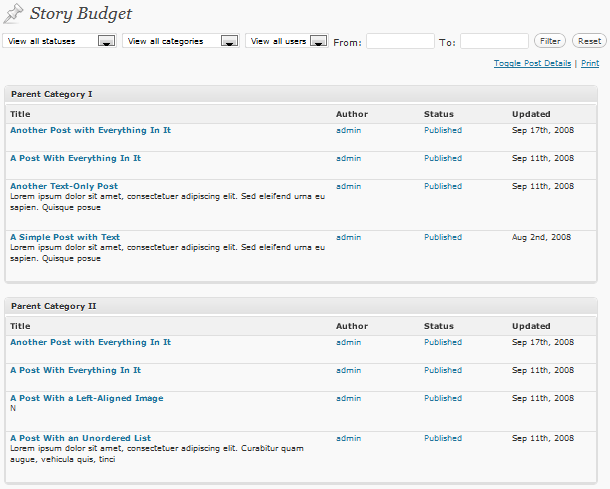 Bug fix: Only show “authors”, or contributors and above, in the user dropdown for the calendar and the story budget. This new behavior can be filtered out however. On that note, getting involved with the code side of the project is now easier than ever. We’ve moved all of our project management to Github. If your code snippet works well and meets our standards, we’ll add it to our site documentation and thank you profusely.